The Lesson Builder allows any educator to create a lesson around Pulitzer Center journalism and is a simple, shareable way to bring the world to your classroom. It also enables users to access lessons created by Pulitzer’s community of educators and journalists, and the database is searchable by topic or keyword, allowing users to modify and save any of the lessons. 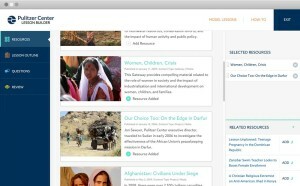 Pulitzer Center has compiled a page in Lesson Builder geared specifically toward Letters to the Next President 2.0, which encourages learners to think about a range of issues they could address in a letter to the next President, including climate change, forced migrations, and other population problems like water and sanitation.